makes me happier than Marian when she hosts her Halloween blog hops. I've been dreaming of this all year long! This is "Haunted Howlings" by Marjorie Peck at Pecks Pieces. but never managed to get quilted. I got a chance to play around with the quilting on this one. What a fun way to get a little practice in. The ghosts are made of organza. Marjorie has great info on her blog, about working with it. Did he make into the cutest lap quilt? I used my Accuquilt GO cutter and ric-rac die on this. I have to tell you...I absolutely "LOVE" that ric-rac die. So many things you can do with it! It's another of Marian's wonderful designs. I just had to add it into my quilt. She's done more Halloween Sayings too. They are all so stinkin' cute! I've printed out the last couple of blocks, but didn't get them done in time. Sorry, it was that whole wedding thing...LOL!!!! I choose to use the QAYG method here. 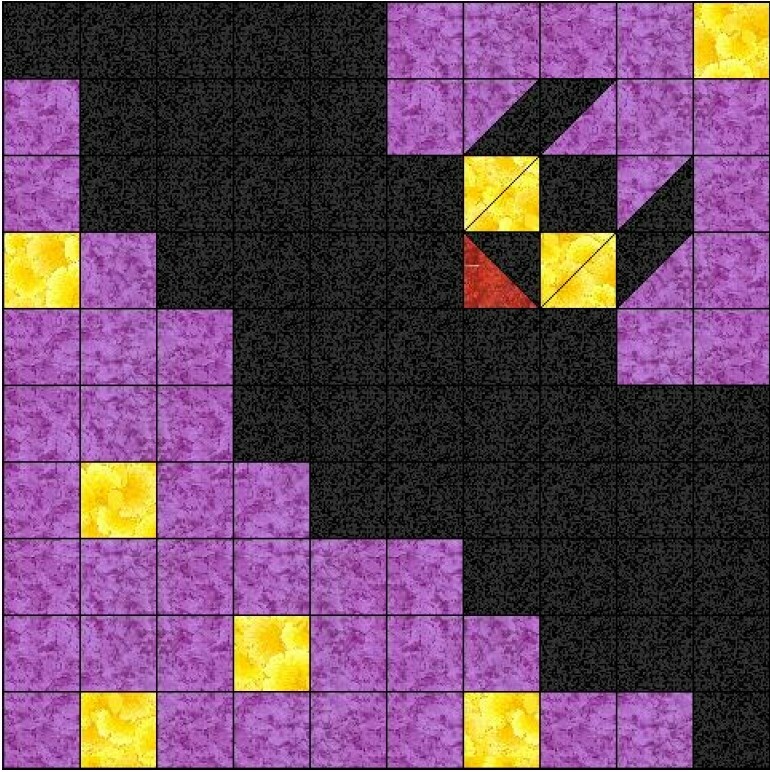 The block pattern I used is from "Kittens Halloween Party". You can read up more on that, on my Oct 11th post. and I am loving how it's turning out. Thanks Marian a hauntingly delightful, set of designs. A big thanks also goes out to "Timeless Treasurers" for todays give-away. I "Entered and I Dared"
The kid in me lives on. 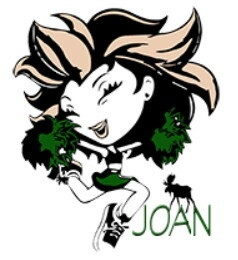 We can thank Ms. Marian for another great blog hop. Can you give us a hint on next years theme? Cause I'm dreaming of a purple and orange, Halloween! Everything you do for Halloween is such great fun. Love the spooky ghosts and the hat and the bat and the words and .... everything!!! Wonderful projects! I love the organza ghosts! Fabulous projects. Love those organza ghosts! Your projects are all fantastic! Looks like you have been busy with the patterns! I remember the Haunted Howlings. That looks great! And I really like your bat quilt! Thanks for the show. Hadn't heard "PIGS" before but I love it! Glad you finished - it's lovely and I love the bat quilt too! Love the bat quilt. It is so cute and the hat on the corner just adds tonit! Terrific projects! Thank you for sharing your creativity! Wow, I love all of your projects. I love decorating for Halloween, and your projects just add to the fun. Your PIGS is a winner. I love those little ghosts. Those last blocks are going to make an amazing quilt too. Great colors! What a fabulous idea to make the ghosts out of organza! They are perfectly spooky and see through! I need to remember that...your ideas are amazing! 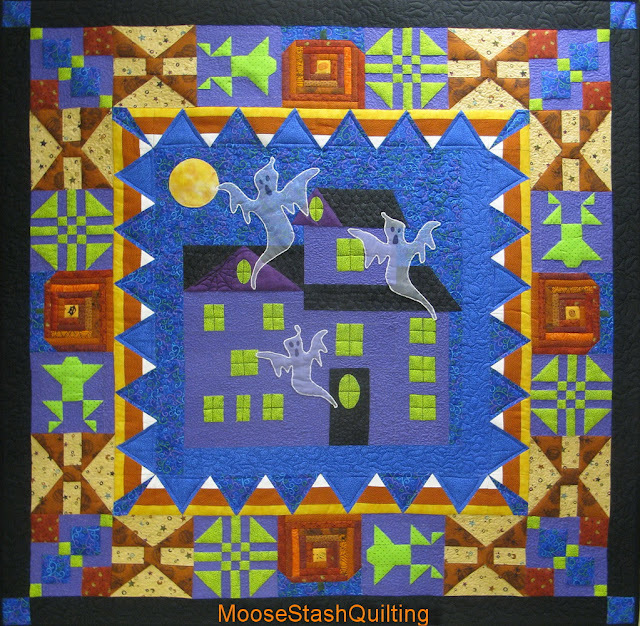 Just love the Haunted Howling quilt! Love all your projects! 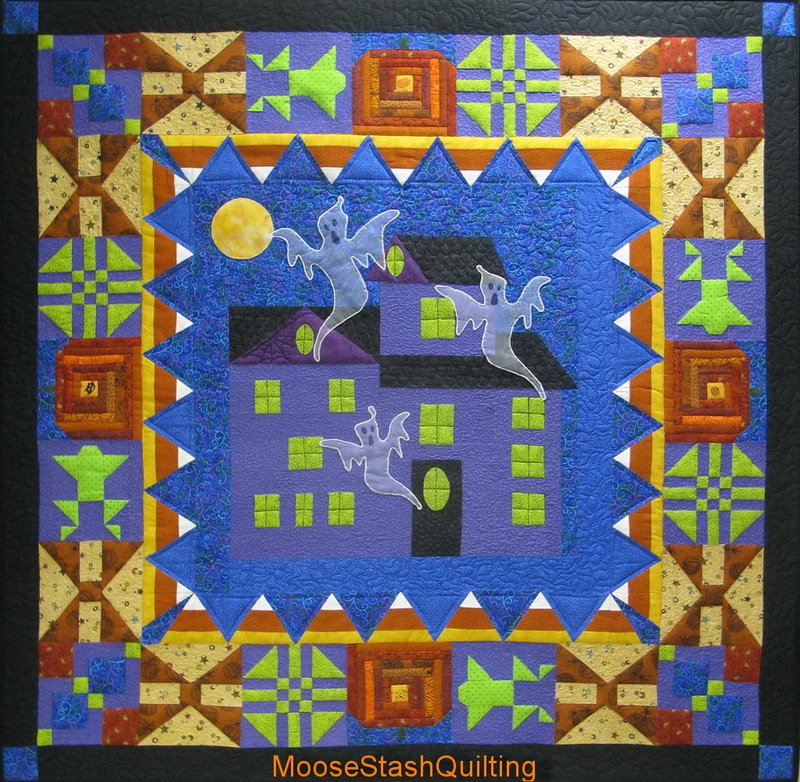 I especially love the haunted house quilt with the ghosts. Spooky! I love your quilt and the way you did the ghosts! Very creative! I really like the blocks with the words, looks like a LOT of work! I love Halloween, everything about it--the fabric, quilts to make and decorating! I love making Autumn things. your projects are wonderful. Great projects! I love how your bat turned out. Thanks for sharing! That lady at Peck's Place is so talented with her patterns. I've always adored them. I love how you did the pattern tho, the various colors just really work great together, adding the brown/tan just really enhances it, I'd never have thought to do that. Of course working with organza is never easy, it's so flimsy and slippery, but you've done her technique justice. Sew many cute ideas! Thank you! Wow, do you ever sleep? :D I love the organza ghosts and especially what you did with Marian's Halloween sayings. 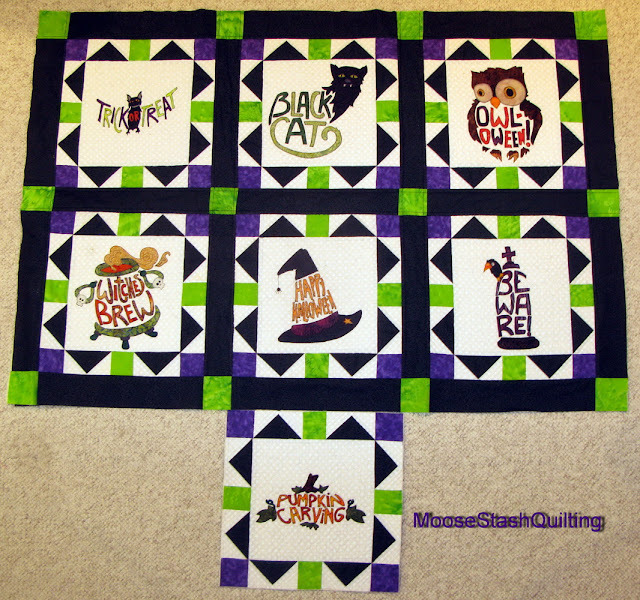 Haunted howlings is an awesome quilt. Love it. Great colors and composition on the ghost quilt. Wonderful pig, well.... They are all wonderful projects ! Thanks for sharing. It's never disappointing to see what you come up with...I love them all! Would have never thought to use organza for see-through ghosts. Such a fun finish! Oh My Gosh, Halloween is so much Fun! Liking your projects! Great quilt! I especially like that house! Thank you! Love the translucent ghosts! Those look so cool!! What wonderful creations you are sharing today. I love the way you use color and pattern. Perfect Halloween .. love the PIGS - have not heard that term before. LOVE YOUR GHOSTS!SO NEAT!THANKS FOR SHARING! You amaze me with all of your great projects! The organza ghosts look suitably spooky! Love how you turned Marian's blocks into your own quilt. Thank you for sharing your talent. HI,Thank you for showing us THESE PROJECTS> PIGS=CUTE!!! What wonderful projects you have shown us! Your organza ghosts are perfect - I'm stealing that idea for my next Halloween quilt. Thanks for sharing. All of your quilts and blocks are wonderful! I especially love the ghosts! Wow, love your halloween quilts! I especially like the organza ghosts. Very clever to make them with organza. And your word quilt with be darling when it's finished too. Thanks so much for sharing! Adorable! And, I love the sheer fabric you used in making your ghosts. Clever! design you have some really cute designs. Oh my gosh! Each one is cuter than the one before. You really DO love this season of the year. All great and winning quiltings! 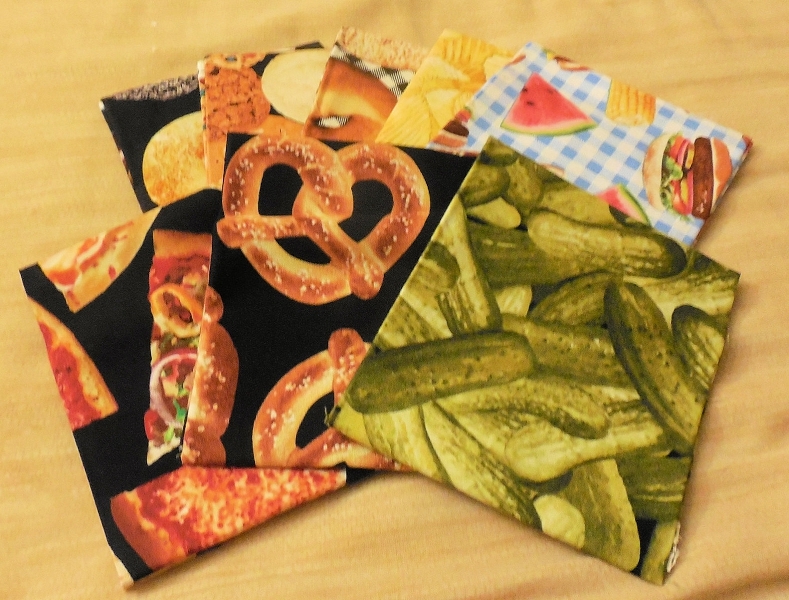 So many (sew sew many) fabulous projects. Thank you so much for sharing. Oh boy, those GHOSTS are BOOO-tiful! They just look so hauntingly fun! Awesome projects....so fun and inspirational.